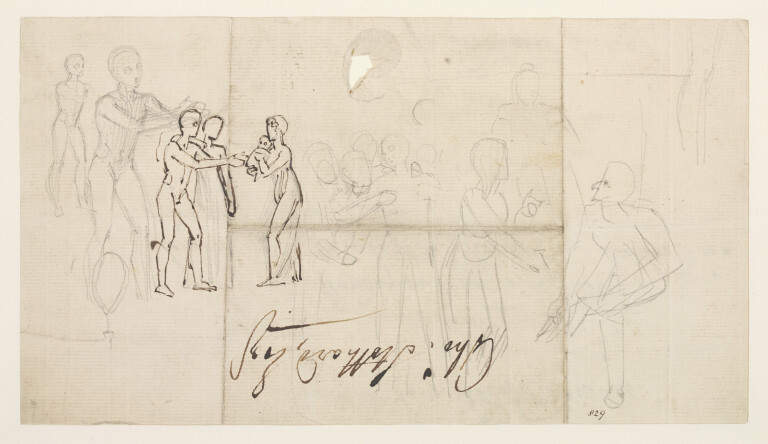 Hector and Andromache, as he is about to take Astyanax from his nurse; Sheet of studies, of which the last is a more finished sketch; Drawn in pencil, some of the figures outlined with the pen; On the back of a summons to a meeting of the Royal Academy, signed by John Richards, R.A., Secretary, and dated 12 Dec. 1804. On the back of a summons to a meeting of the Royal Academy, signed by John Richards, R.A., Secretary, and dated 12 Dec. 1804. Stothard, Thomas; Hector and Andromache, as he is about to take Astyanax from his nurse; Sheet of studies, of which the last is a more finished sketch; Drawn in pencil, some of the figures outlined with the pen; On the back of a summons to a meeting of the Royal Academy; English School; ca. 1804. 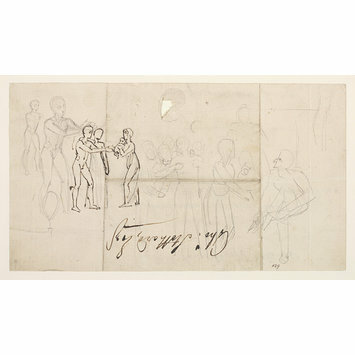 The studies are drawn on the back of a summons to a meeting of the Royal Academy, dated 12 Dec. 1804.